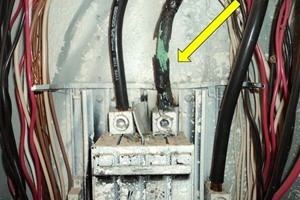 Fort Worth Home Inspector finds Overheated wiring in this Electrical Panel Box. This is a possible fire hazard. This is an example of why Electrical Panel Boxes should not be located in closets. If clothing had been laying against this panel door and the wire had overheated there could have been a fire. Another great safety find by Professional Home Inspector Chris Goggans.